A problem tree provides an overview of all the known causes and effect to an identified problem. This is important in planning a community engagement or behaviour change project as it establishes the context in which a project is to occur. Understanding the context helps reveal the complexity of life and this is essential in planning a successful change project. A problem tree involves writing causes in a negative form (eg. lack of knowledge, not enough money etc). Reversing the problem tree, by replacing negative statements with positive ones, creates a solution tree. A solution tree identifies means-end relationships as opposed to cause-effects. This provides an overview of the range of projects or interventions that need to occur to solve the core problem. Provides an outline of the project plan, inlcuding the activities that need to be undertaken, the goal and the outcomes of the project. A problem tree provides a means to help you select what behaviours you may want to target in your project. In this way, a problem tree links in with the selection of behaviours step in Community-Based Social Marketing (CBSM). Conducting a problem tree/solution tree analysis provides a means to review the existing understanding of the causes to a specific problem and how it can be overcome. A problem tree will likely reveal multiple branches (cause & effect relationships) leading to the core problem. This is very valuable as it identifies factors that may not be addressed by the planned intervention. For example, existing regulations may be a factor in the problem, but this may not be impacted upon by the planned intervention. This may result in the failure to achieve project objectives. It could be that impacting upon regulation is not achievable and thus out of scope for the project. If this is the case, then the evaluators need to account for this when the intervention is evaluated. 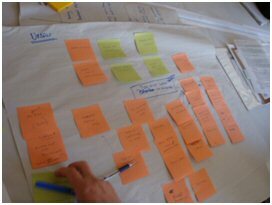 A problem tree is best completed with the project proponent and other stakeholders present. The stakeholder analysis and literature review (if available) should also inform the development of a problem tree. 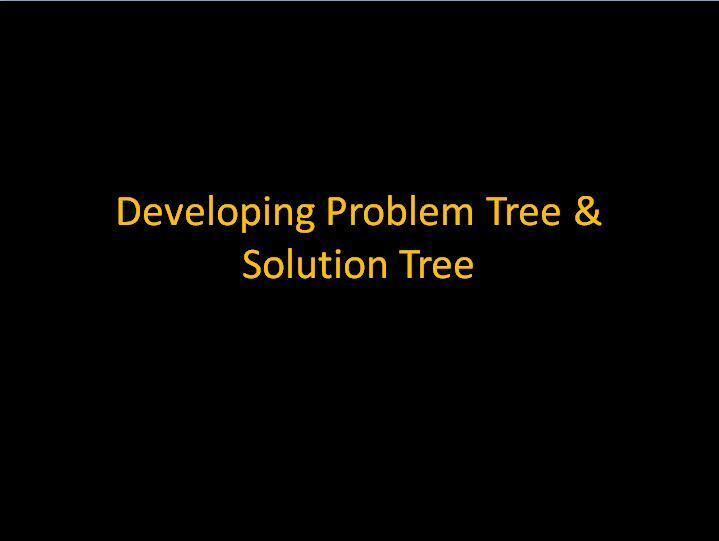 A short tutorial presentation on problem trees is available here. The first step in developing the problem tree is to identify the problem that the project seeks to overcome. It may be worth debating what the core problem is with stakeholder representatives. Ideally projects should have a specific problem (eg. saving water inside the home) that they seek to overcome if change is to occur. A vague or broad problem (eg. saving water) will have too many causes for an effective and meaningful project to be developed. The core problem is written down in the middle of the paper, or on a sticky-note that is placed in the middle of a wall. Things to help define the core problem include lessons from previous projects, the stakeholder analysis, and other research. 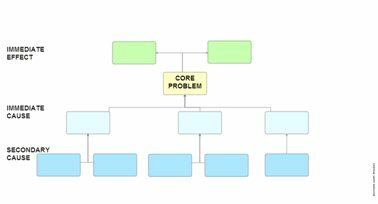 If there seems to be more than one core problem, it may be best to develop a problem tree for each one. 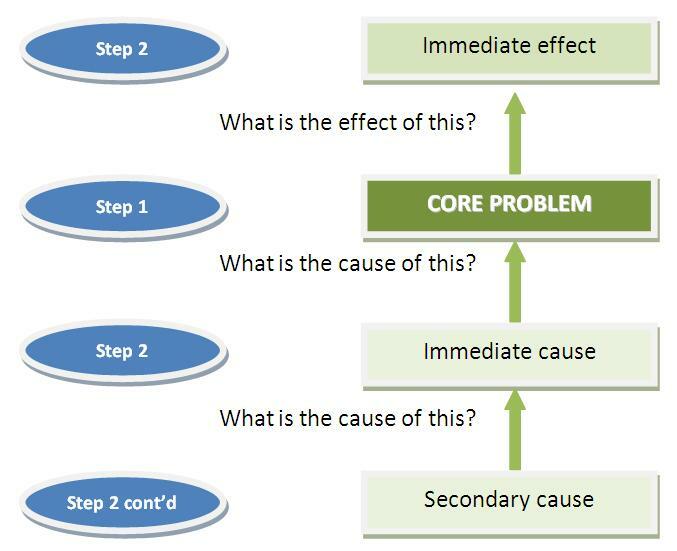 Once the core problem has been identified, participants should consider what the direct causes and effects of the problem are. Each cause statement needs to be written in negative terms. There are a couple of ways to undertake this. Participants can either collectively brainstorm all the negative statements about the problem at hand, and a facilitator writes each negative statement down on a piece of paper. The statements would then be placed on a wall, for the participants to analyse and reorder. Alternatively, participants could work through the cause and effect on a sequential basis, starting from the core problem. The immediate causes to the problem are placed in a line below that of the core problem. The immediate effect is placed above the problem. Any further or subsequent effects are placed above the line of immediate effects. Participants need to continue to repeat the process on further horizontal lines until they are no longer able to identify any further underlying causes. It is important to review the sequence of cause and effects to make sure that they are clear and make logical sense (eg. does this lead to that, or is there a missing step, and is this the effect of that happening). It is important to ensure that there is agreement among the participants. If there is more than one cause to an effect, you can place these side by side. Once the order or placement of all the cause and effect relationships is agreed, they can be linked with vertical lines. Horizontal lines can be used to join related causes or effects. 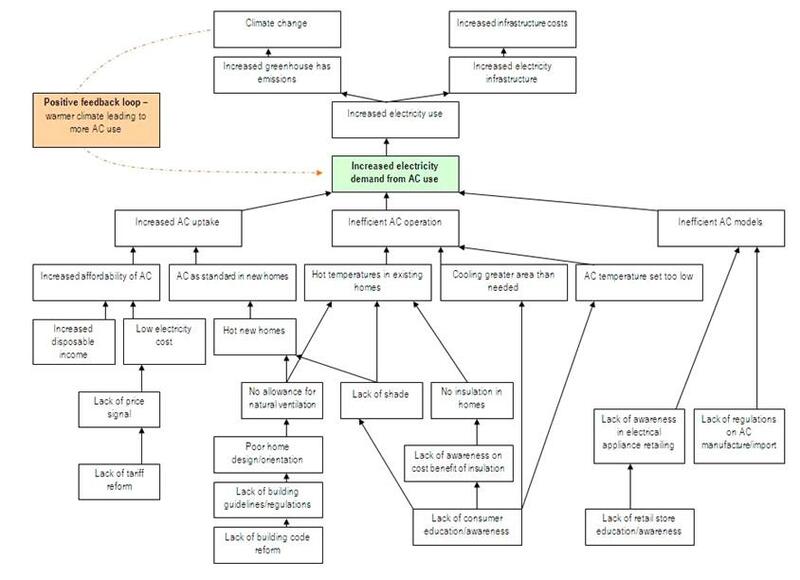 The result is a problem tree which outlines the cause and effect relationship between the different levels. A solution (also called objectives) tree is developed by reversing the negative statements that form the problem tree into positive ones. For example, a cause (problem tree) such as “lack of knowledge” would become a means such as “increased knowledge”. The objectives tree demonstrates the means-end relationship between objectives. It is advisable to go through the solution tree and check to see if all the statements are clear, and if there are any missing steps between a means and an end. If so, you may need to revise both the problem and solution trees by adding more statements. The final step is to select a preferred strategy for the intervention. This step is designed to allow the project design team to select and focus an intervention on a preferred strategy. 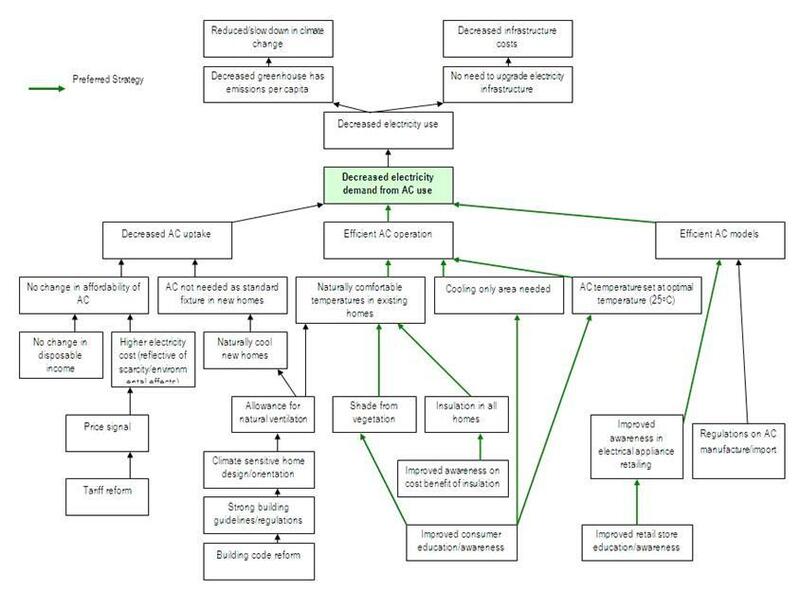 The solution tree may present a number of separate or linked interventions to solve a problem. Depending on project funding, time, and relevance, a planned intervention may not be able to tackle all the causes. However, it if all the causes cannot be overcome by a project, or complementary projects, it is important to identify if any of the branches are more influential than others in solving a problem. For example, if existing regulations are found to be a dominant factor, but this is not tackled by the project, this would need to be taken into account in the evaluation of the intervention. Once you have selected your preferred line of intervention, the core problem/solution is your immediate objective or outcome. The branches below are the activities that you need to undertake, and the branches above become the longer term outcomes. You can now look at using this information to develop a logframe matrix, which provides a summary of your project logic and monitoring plan in one, or you can develop a program logic and a seperate monitoring and evaluation plan.